It is imperative to finish these courses because you will feel much more confident when you have a certain degree of experience in your hands. Just imagine a situation where you could have saved someone’s life, but you didn’t know how to deal with it. These are the situations that we as paramedic coup with every day. 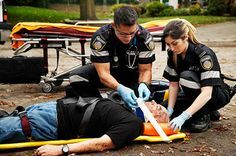 These courses will help you and will build you confidence as a paramedic to be sure in your knowledge and your routine. There are millions of situations out there that regular courses or schools can’t predict. The system is too slow to implement new situations and discoveries. That is why you should do a course, and that will keep you up to date with all new things that you can find in the street. Sometimes you will be in a situation where your knowledge can’t help you. If you are not certain what to do, don’t do anything. Act in your domain and after that stop. You could cause potential damage to the patient, and that could be a pretty tough situation. If you don’t know what to do, wait for your colleagues to come that have the knowledge about the certain situation. These situations are tough and can be prevented with one of these courses that you can find on our website. Keep in mind that even though you have finished one or many other courses, it is not a guarantee that you will know everything for every situation. That is why these courses are important for people like you to always take them and constantly upgrade your knowledge. When you encounter these situations as a paramedic or a nurse in a team of paramedics, you will need to stay focused and remember the things you have learned. Combine the knowledge with your colleagues, and you will find a solution that can help that person on its way to the E.R. Some things are better if you do it together. It will be tough, and it will be scary, but you know that it is up to you to save that person’s life no matter what. So make sure that you give you best shot. It is a subject that most of the people don’t think about. Imagine if there were no paramedics. The percentage of deaths would increase dramatically. Imagine if there weren’t people who would stabilize your health on your way to the hospital. Their role is very big and very important. As you can see, without them, doctors would have much more unnecessary work, and that is not a good thing. To keep someone stabilized is an important factor to help the doctors or surgeons to have minimal risks when curing or operating someone. These things if done properly could increase someone’s chances of survival. Then again, if something doesn’t go right, that person could die. A situation where no one will be happy. SO to make paramedics efficient, the state needs to give them the proper training. As we all know an extra course is needed. To be a perfect paramedic team, you will constantly need to go to courses to improve your knowledge. There will always be some discoveries which can help the paramedic teams and the patients in almost any way. So it is imperative that you are properly educated and kept up to date to provide the best possible service for your patients. Of course, no one can make a guarantee that you will be able to save every single life, but the chance will increase once you are capable and fully equip. The equipment is not a problem; the problem is the knowledge and the experience with that equipment. That is why courses like these exist. In other to be the best paramedic you can be, you will always have to work on yourself. Attending courses that are a must by the law or even in your spare time are a good thing for your experience and your knowledge. The more you work on yourself, the more you will be up for the challenge. Lives of those people are in your hands. First of all, we have heard a million times that people want to become doctors, nurses or paramedics. You should know that neither of these jobs is easy. For now, we will talk about the workers in the paramedic service. Their job is pretty stressful. First of all, you need to stop whatever you are doing on your station and in a state of alert get your gear ready and go out to help someone. Keep in mind that the scenes where paramedic needs to come are very unpleasant. By unpleasant we mean scenes with blood and pieces of a human body lying around. Still, want to be a paramedic? Then you could have a situation where there was an accident. People are trapped in a car. You need to get them out, but you can’t move them because you don’t know if some object is inside their body that could kill them. So you are on the scene, you need to pull someone out of the vehicle. Fire department gets them out and then what? Now you need to check for vitals and see is there anything you can do to help those people. You can’t move them or at least put them in a position where they could choke or break something. You need to check if there are items that are stabbed in them. If you remove them from the body, you could start the bleeding. As you can see a lot of stressful situations. Once you secure the patient, you will need to be careful how you pick them up and put them inside the paramedic vehicle. After that, you will need to stabilize them in the van until you reach the hospital. This can sometimes be a task that is impossible. On your way to the hospital, you will do your best to secure those people and to make sure you keep them alive until you reach the E.R. After that you can calm down because the doctors will handle the patients if they can. Sometimes there is nothing you can do. People can come with a lot of injuries, and the best thing you can is to stabilize them and hope that they will be better. The life of a paramedic is full of excitement but also full of tough situations that only the bravest can coup with.